Today I travelled through the Milwaukee airport and saw the sign above – which has evidently been there for a few years. 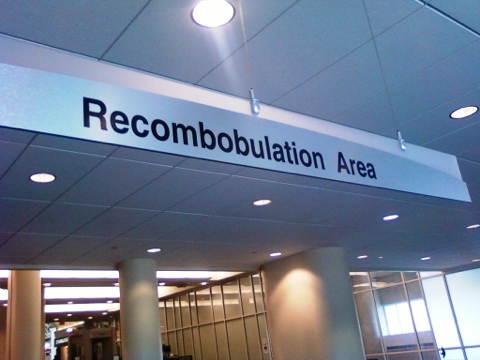 I shared a laugh with a few fellow travelers as we googled our way to confirming that while “recombobulation ” is not a recognized word, it perfectly captures that post-TSA state we all face while traveling. No matter how prepared and experienced we are as travelers, we all shuffle, shoeless and bearing our toiletries in see-through bags, past the x-ray to these little way stations where we can put ourselves back together, ready to face the world. What other capabilities would you like to see in your personal workplace recombobulation area?